Found a small box of vintage lights and reflectors. The punched tin group are my favourite pieces. 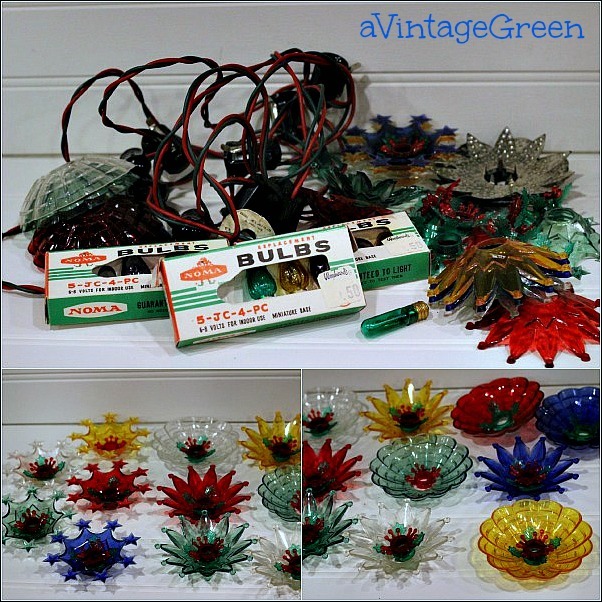 Plastic yellow, green, red, blue and clear with inset pieces. Couldn't plug them in (plug was damaged). Woodwards. Loved that store. Started to decorate at home, holly plus bulbs. 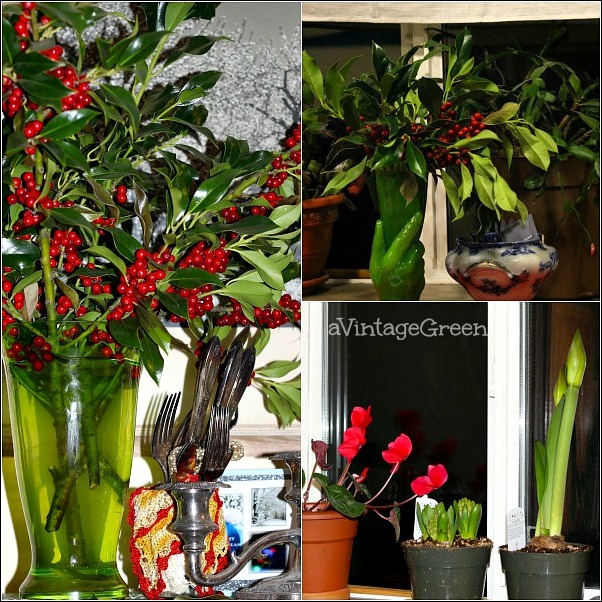 The amaryllis (red striped this year) and hyacinth signal the beginning of the Christmas season to me. 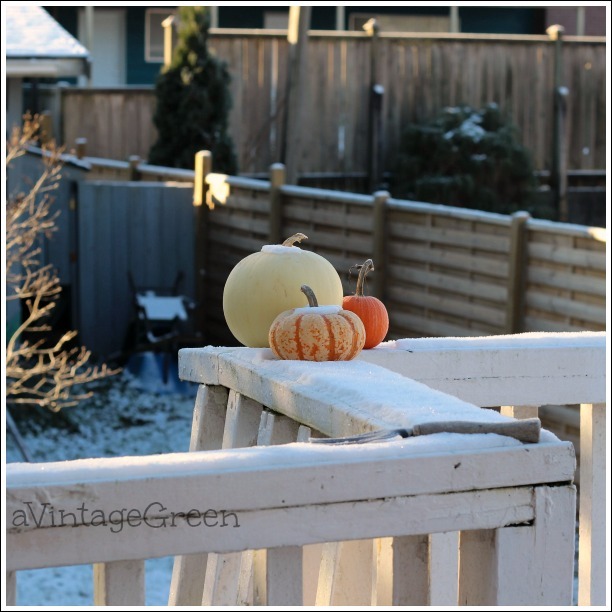 A peek at the snow that stayed for over a week, pumpkins before they leave. Today was 11 degrees C, almost long sleeve weather. First time pumpkins have appeared in my Christmas decorations post. Loved the white contrasting with the orange. 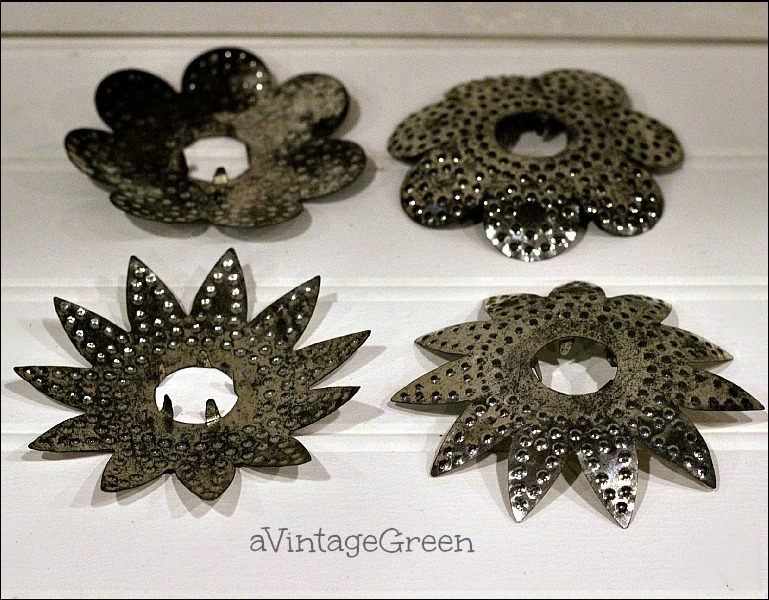 Great light reflectors...I really love the punched tin, too, and found a few awhile back that I hadn't seen before! Fun collection! Oh such pretties here! Always fun to visit and enjoy a quiet moment with my on line friends. Thanks for sharing with us today. The reflectors are a great find. I love amaryllis, too. Your frosty pumpkins are just right! Lovely! I remember when nearly everyone used reflectors on their trees. So pretty! Thanks for making Blue Monday special. The reflectors are pretty and so are the pumpkins sitting in the snow. Those look like fun lights and I love the pumpkins in a bit of snow. that's going to be a sweet tree! Hi Joy, I love the reflectors you found. Lucky you. smile. The pumpkins in the snow look pretty. We had snow for Thanksgiving but it didn't last. My teen grands made a small snowman. I still do not know how they found enough snow. Smile. I will post it soon. Don't we just love the vintage Christmas decorations? Little snow here, so far. We are supposed to get a storm in this weekend, but I would imagine that most of it ends up in the mountains. Oh, I surely do like those deflectors, a lot! 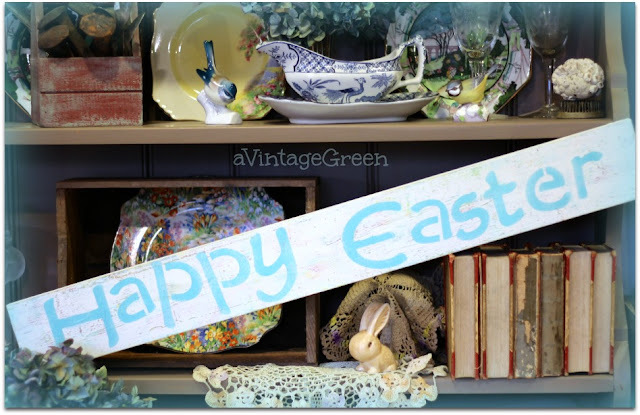 I've been looking for vintage decorations and other than ornaments really haven't found any! That pumpkin wouldn't last a day in our garden the squirrels would of eaten them in a minute! Can't wait to see you tree! I'm totally in love with everything Pinned and tweeted. We appreciate you being a part of our party, and I hope to see you on tonight at 7 pm. We love partying with you! Your reflectors are so pretty!